The Hyundai HYBV26 is a highly-effective combination blower-shredder-vacuum that provides home, estate, leisure and amenity users with the ability to either blow or collect leaves and other light, loose garden debris to suit individual requirements. 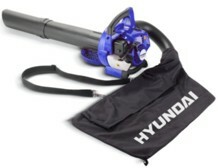 Power in both blowing and vacuuming modes is provided by a reliable and economical Hyundai two-stroke air-cooled engine producing 0.9hp. In blower mode, the HYBV26 is fitted with a tapered nozzle that directs the machine’s 114mph (50 metres/sec) air blast exactly where it is needed to quickly and effectively shift leaves, litter, grass clippings, tree debris and other light, loose material. Users may choose to move blowings into piles or rows, whichever is easier for collection and disposal. In the case of fallen leaves, it may be preferable and quicker to simply blow them back to where they came from, in amongst the trees. Changing the machine to shredder-vacuum mode takes a couple of minutes involving the removal of the blower nozzle and the fitting of a debris pick-up tube, material delivery pipe and a 40 litre collection bag. All of the leaves and other debris collected by the machine in vacuum mode pass through fully-guarded, high-speed revolving blades on their way to the bag. This action effectively mulches and minimises the material, increasing collection efficiency and the amount of debris that can be accommodated within the bag before it needs emptying. Supplied with a single over-shoulder support harness for vacuuming operations, the Hyundai HYBV26 weighs just 7.4kg in blower mode. For detailed technical information on the Hyundai HYBV26 Blower-Shredder-Vacuum, please click on the Specifications tab above.